Perhaps your dream leisure break would mean hiding away for the weekend in a peaceful location where health spa and beauty treatments are available to pamper yourself into the perfect state of bliss, or perhaps a break somewhere with access to a first-class, fully equipped gymnasium or golf course would be more your ideal. Whatever your requirements and preferences, there are plenty of leisure break accommodation options available for you to choose from in Suffolk, each one leaving you feeling completely relaxed before you return home. One of the ultimate leisure break options comes to you from Hintlesham Hall Hotel, Ipswich. At this luxury Grade 1 Listed Manor House, placed within 175 acres of beautiful Suffolk countryside, you will discover not only 33 bedrooms of varying shapes, sizes and styles enhanced by fine fabrics, works of art and antiques, but also a vast selection of leisure facilities to choose from, including: a fully equipped gym with helpful instructors, a heated outdoor swimming pool (in season), a tennis court, and the associated championship size PGA golf course alongside the Hotel. There are also various health & beauty and other specialist treatments available that can be booked individually or as part of Hintlesham Hall's Pamper Days offer, which consists of a choice of three one-hour relaxing treatments plus a three-course lunch and other bonuses. Please click on the link above for more information. At the Ufford Park Hotel, Golf & Spa, Woodbridge you can book a one-night Golf & Spa Break from just £79.00 per person! Situated in the heart of the serene Suffolk countryside within 120 acres of historic parkland overlooking the Deben valley, this hotel has everything you could possible want from a leisure break. Fans of golf can partake in the 18 Hole Par 71 golf course, a two-tier luxury driving range, the 4,000 square feet American Golf Shop and - for those less familiar with the sport - the DoctorGolf Teaching Academy. Within the Health Club there is a large gymnasium & swimming pool, and the spa has a state-of-the-art thermal suite operated by highly trained beauty therapists. Specialist Activity Breaks are also available and include residential Bird Watching Breaks where guests can explore the local bird watching sanctuaries. Alternatively, Professional Tours are also available. Please click on the link above for full details and to enquire about all facilities and availablity. For more information on the Best Western chain of hotels, please see Best Western Hotels in Suffolk. 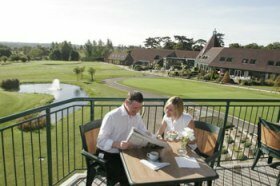 Another great leisure break hotel is The Stoke-by-Nayland Hotel, Golf & Spa. 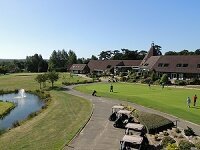 This hotel has all of the same spa & gym facilities and pampering treatments as mentioned above, but also has TWO 18-hole golf courses for you to work your way around! In addition there are extensive conference, banqueting and function suites, a selection of dining facilities to suit every requirement, and a beautifully appointed, newly extended 80-bedroom hotel. The Fox Inn & Restaurant, Bury St Edmunds, is a lovely, traditional family-run Suffolk Inn located within the conservation area of Bury St Edmunds, beside the Abbey Gardens and just 5 minute's walk away from the centre of town. Along with their excellent 'gastro' food and high quality drinks plus boutique accommodation, the Fox Inn has teamed up with the SK Clinic & Spa (just 3 minute's walk away) to offer luxury spa breaks and treatments for just one night, or for the whole weekend. You will be entitled to a discount at the SK Clinic by quoting your Fox Inn room number - please click on the link above for full details. As you can see, Suffolk is the best choice when planning your Leisure Break this year and say goodbye to stress! Have you been on a Leisure Break in Suffolk? Let us know what you thought by Sending Us an Email.